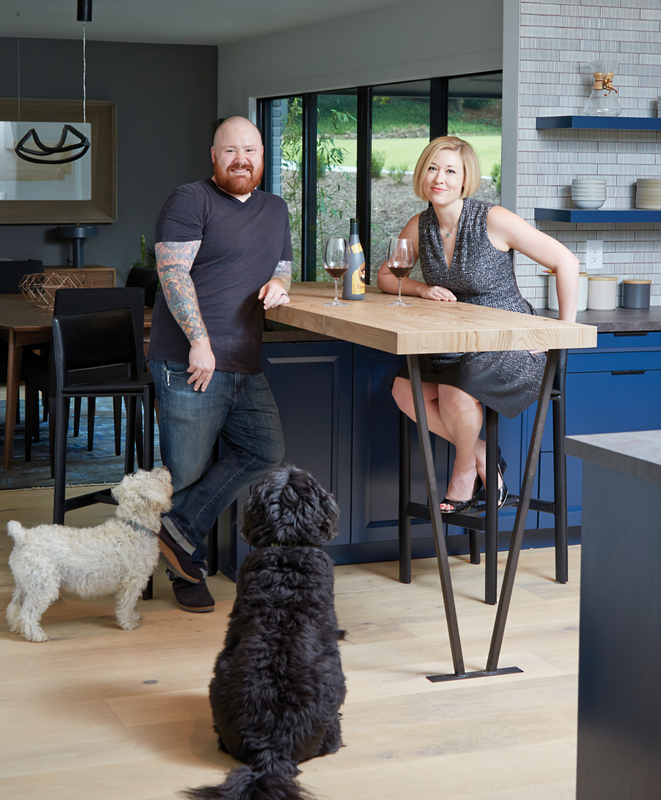 Kevin Gillespie and Valerie Combs were married in 2011, after being introduced two years earlier by one of his cooks, Andreas Müller. Kevin’s company is aptly named Red Beard Restaurants. Kevin’s wife, Valerie, first discovered the house on Zillow. Designed by Cooper Carry, a national architecture firm founded in Atlanta, it had remained largely untouched since it was completed in 1968. She immediately knew they’d both love the ranch-style abode and submitted an offer even though Kevin was out of town. 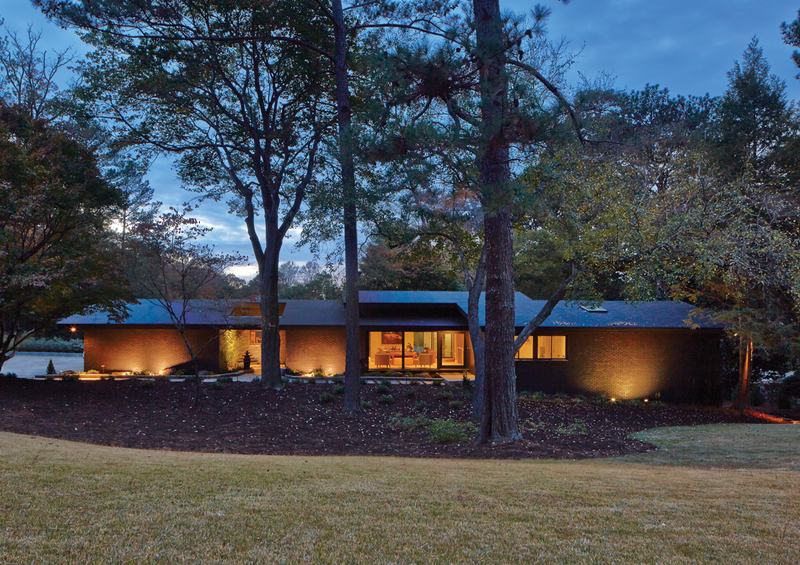 New landscaping and a black facade give this 1960s-built house a contemporary flavor. A mix of new and vintage furniture fills the living room. 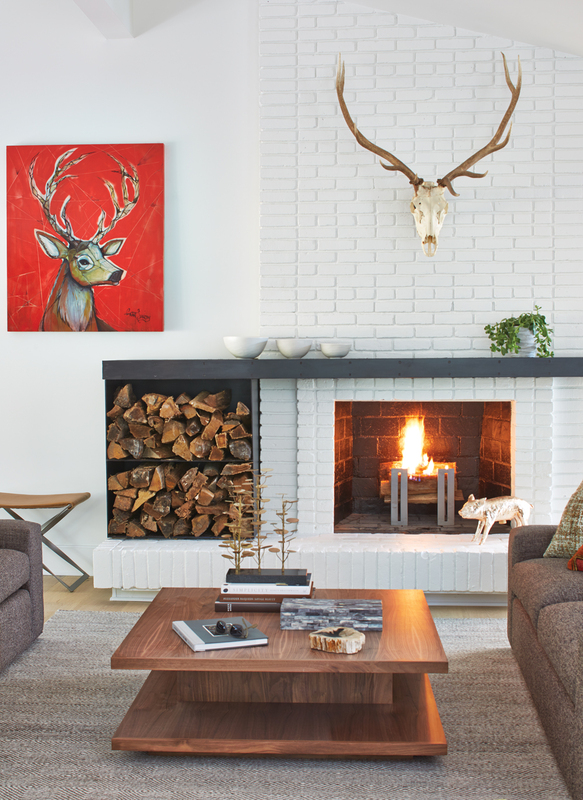 The coffee table and custom sofas are from Room & Board. 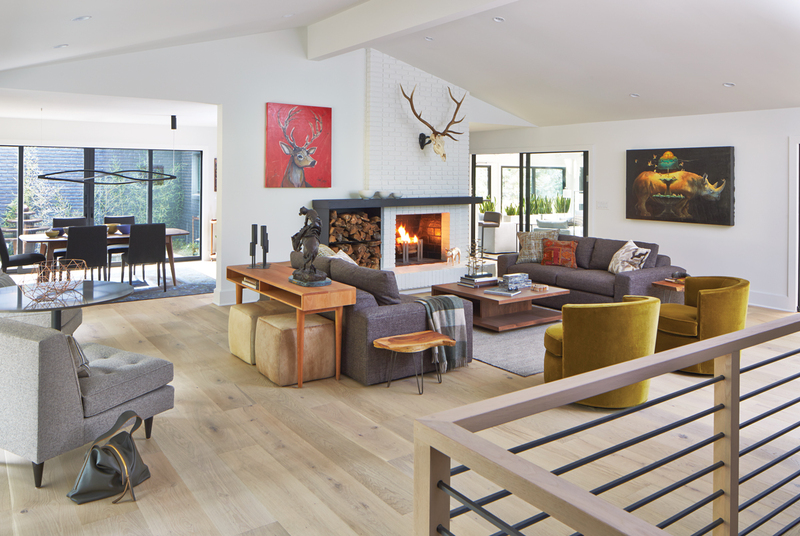 To update the choppy floorplan, the Gillespies launched a major remodel—essentially keeping only the exterior shell and a fireplace intact while opening up interior spaces. Working with Kevin’s restaurant contractor, Malone Construction, they spent a year installing new floors, reconfiguring the kitchen and baths, and transforming the sun porch. “We tried to be true to the period, but in some cases, we chose materials that we felt like the architects would have used if the materials were available in 1968,” Kevin explains—such as energy-efficient windows and manufactured white-oak floors. What does this chef serve at home? “My wife says they are the best ever,” boasts Kevin. Do you really cook duck confit in a warming drawer? The Gillespies painted the low-slung exterior black, which harmonizes well with the home’s wooded setting. 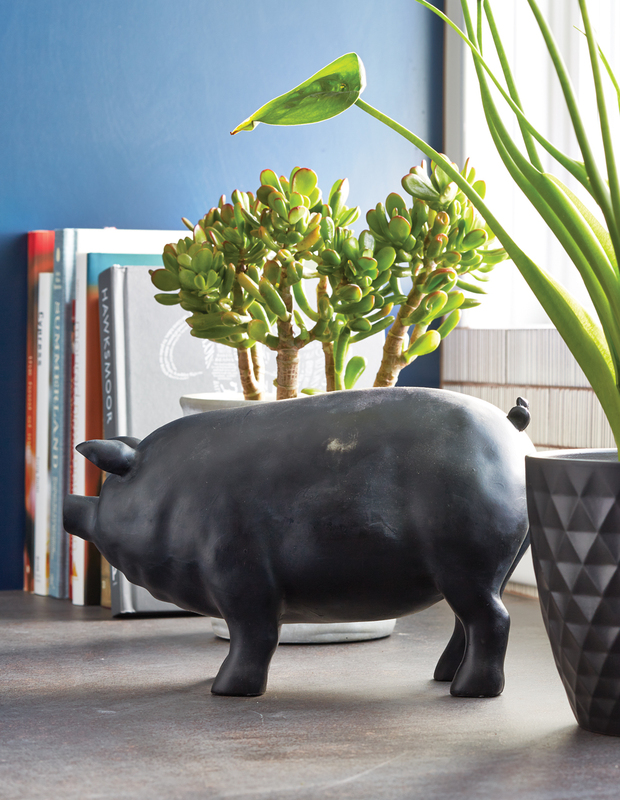 “I’m a little bit of an architectural nerd,” Kevin says, “and I’ve seen that the green in trees and grass shows up better with black as a backdrop.” They selected a historic hue—“Lincoln Cottage Black” by Valspar—for its classic color. It took four coats to properly saturate the house. 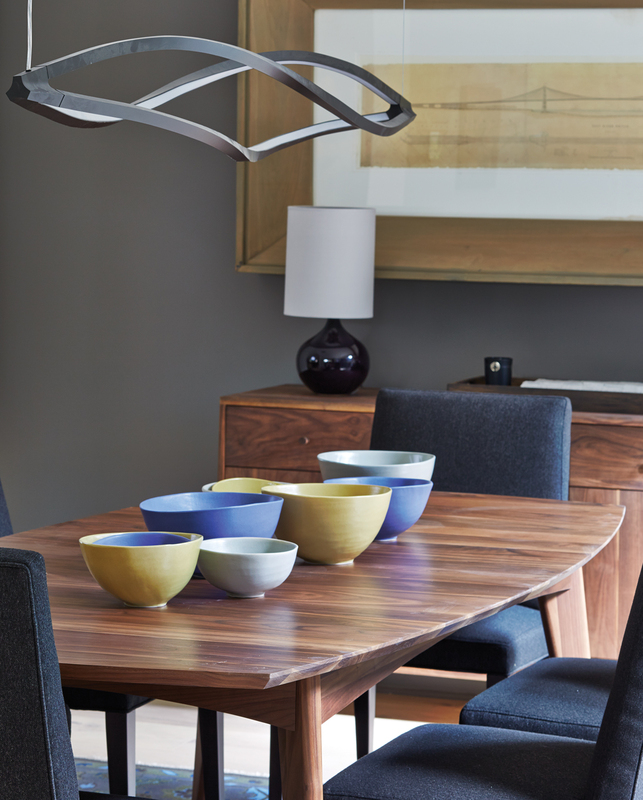 An Italian light fixture by Nemo adds a sculptural quality without blocking views across the dining space. The Gillespies opened up their home’s interior spaces, essentially keeping only the central fireplace. 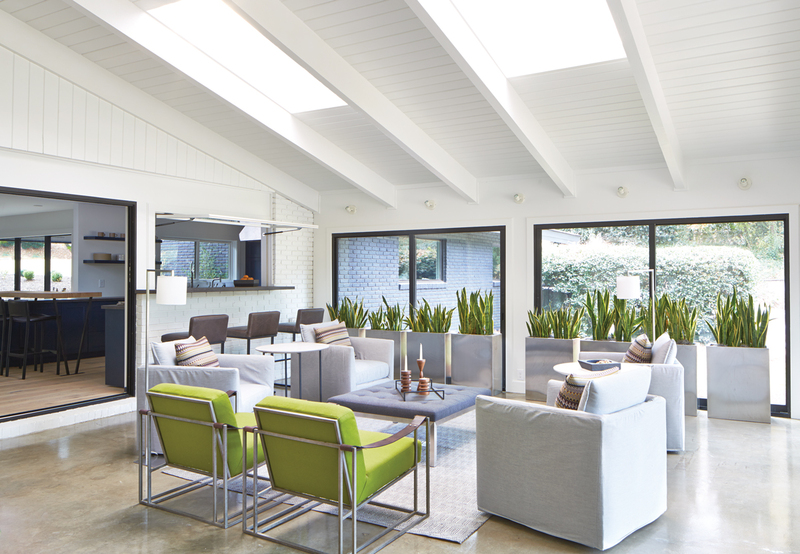 Kevin custom-designed the green chairs with leather arms and powder-steel legs after seeing similar chairs in Sonoma. 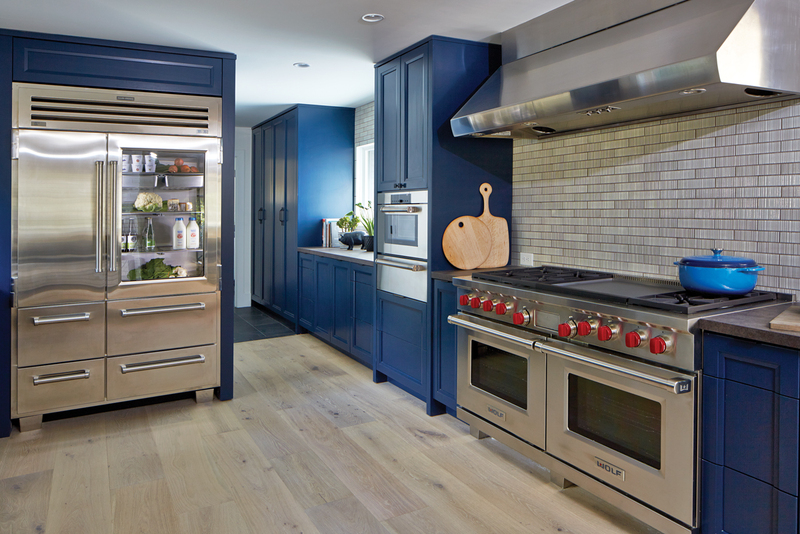 In the kitchen, blue cabinets and a dark countertop with the look of iron are paired with serious stainless-steel appliances and light gray Ann Sacks tiles as the backsplash. With that philosophy, Kevin and Valerie took their time acquiring furnishings that fit the scale of the house. 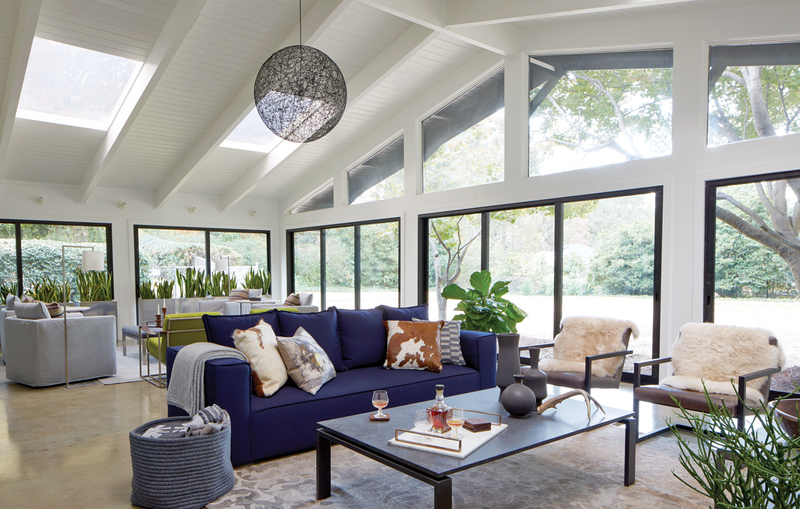 Room & Board provided many pieces, including the living room’s custom symmetrical sofas, purposely oversized to avoid the stiff feel of some vintage furniture. Animal-themed art appears throughout the house, along with paintings by Kevin himself—the light-filled sunroom often serves as his art studio. Kitchen Ovens: Wolf Range, subzero-wolf.com. Refrigerator: Subzero. Dishwasher: Asko, askona.com. Backsplash tile: Ann Sacks, annsacks.com. Countertops: Neolith, neolithcountertops.com.